When I was a young girl, the expression, “come just as you are” was a common one for impromptu get-togethers and was often used when the one invited had multiple excuses for not accepting the invitation to a spontaneous fun time. The excuses were varied and ranged from, “my hair is a mess” to “I haven’t a thing to wear” etc. The one inviting was insisting that between friends, outward appearances didn’t matter, but the friend’s company did. I was thinking back on that teenage angst of always worrying about how we appeared to others, when I remembered a momentous invitation that was made to a group of probably dirty, possibly smelly group of people, who didn’t rate anywhere on the social scale, and were looked down upon because of their lowly job of minding sheep and yet were allowed to come into the presence of the new born King of kings. On that incredible night, those shepherds had no thoughts about quickly combing their hair, had no clean cloak to pull out of the cupboard, didn’t check their finger nails, just hurried as quickly as they could, to see and to kneel before the Christ child and they were welcomed just as they were! 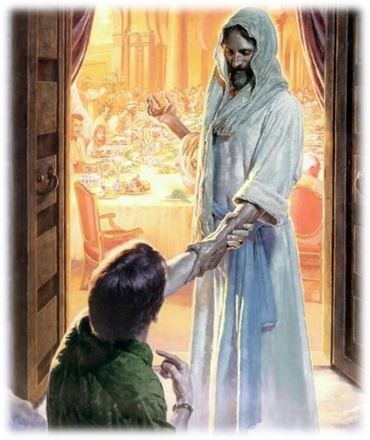 Later when Jesus extends the same loving invitation to his disciples, there are no conditions to observe in regards to suitability, he doesn’t ask for references from previous employers, no police checks, just these loving words, “Come and see” He accepts them just as they are. It is very difficult for many of us to believe that our Saviour accepts us just as we are. Nobody who accepts his invitation to be with him, will be turned away because they don’t measure up to some set of strict rules, but still we feel he will only love us if can prove to him how good we really are. How foolish of us not to welcome his all-embracing unconditional love that only expects us to believe in him and to be willing to follow in his footsteps. One of my favourite encounters Jesus had with someone, was his summoning Zacchaeus down from the tree and announcing that he was coming to dinner and staying the night. Zacchaeus’ response is heart-warming. He doesn’t worry about whether Jesus knows he is a dreaded tax collector or the state of his house or what he will give Jesus to eat, he realises the Saviour is loving him just as he is and there is no longer any need for pretense. When we grasp there is no longer any need for pretense in front of the Lord, we are liberated from that dreadful feeling of always having to measure up. This liberating feeling then spills over into our personal lives. We allow others around us to just be who they are. Not insisting that they conform to our pattern of living. The beautiful words, “just as I am” became famous in 1835 when Charlotte Elliot incorporated them into a beautiful hymn which became world known as the hymn Billy Graham used in his altar call at the end of his crusade message. These words were to give millions the freedom to leave behind whatever was holding them back from embracing that unconditional love so freely offered by the Lord. So too we can answer that call and come just as we are. What a calming message for this time of the year. It makes the current worries – what will I wear to the Christmas lunch, will I get the cards finished, have I bought enough presents – seem so unnecessary. And if the rest of the family doesn’t measure up – so be it! Thank you Jo for reminding us to relax and enjoy this happy season.